H x W x D: 650 x 470 x 420mm. Manufactured from 30% recycled polyethlene. Easily manoeuvrable on 50mm castors. "These small wheeled waste bins offers a compact and convenient solution for your waste management. They are suitably sized for indoor use at 50L and are heavy duty, making them perfect for commercial and industrial environments. Manufactured from 30% recycled Polyethylene adds to their durability and strength, reinforcing their suitability for substantial waste environments within industries, such as Schools and Cinemas. The 50L wheeled waste bin has the benefit of being easily manoeuvrable on 50mm castors and weighing just 3kg, allowing you to easily relocated them to any suitable location. 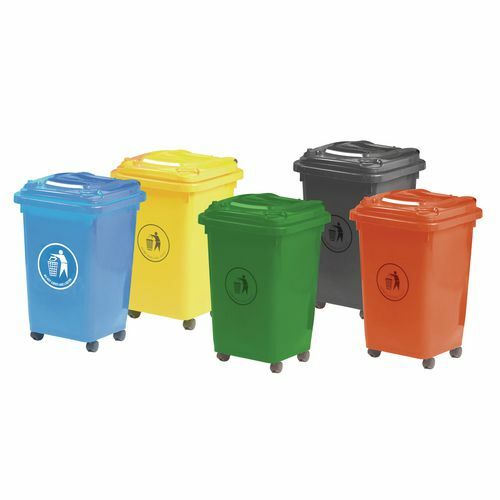 These bins all come in a typical size compromising of a height of 65cm, depth of 42cm and width of 47cm as standard. They also comply to BS/EN 840. For convenience the bins are available in 5 different colours, blue, green, dark grey, red and yellow, allowing you to choose the colour you require depending on the needs of your business."